We want to charge you as little as possible for this service. To help us achieve that the following are some suggestions to help achieve that. If you are able to pay off all of your suppliers, collect all of the book debts, sell off all of the plant and other assets (at market value), just leaving a bank account we can effectively and inexpensively liquidate your company. It helps if all of your VAT returns and PAYE returns are up to date. Your accountant will also need to have prepared annual accounts to the end date of trading and have worked out the corporation tax due. The above costs are plus VAT and any disbursements. if you have more than five shareholders or creditors we may need to quote a revised fixed fee. Find out more about the costs of a members voluntary liquidation. Our agreed fee with you. The bond cost we have to pay on each and every case (e.g. a case with £400,000 of assets the bond cost would be £520). The costs of the statutory advert in the London Gazette (typically £325 plus vat). Any other expected creditors that have not been paid (for example the final Corporation tax bill). We can transfer assets such as freehold property (called ‘distribution in specie’) or rights to other assets if you cannot sell them (for example; if you have sold the business and are receiving payment by instalments we can transfer them to you). Members Voluntary Liquidations are used as a method of extracting company’s funds and for shareholders to claim Entrepreneurs Relief (meaning the shareholders only usually pay Capital Gains Tax of 10%). Prior to instructing us you will need to take tax advice from your accountant to make sure you will qualify for the 10% tax rate on capital gains. They are welcome to ask us any questions and we can make suggestions on the timing of events. 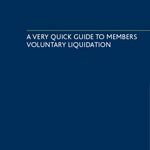 If you would like to know more please download our printable 11 page Quick Guide to Members Voluntary Liquidation. Or click the icon below. This is a very useful section under the Insolvency Act 1986 whereby a company can be split up into two or more trading entities without creating a tax charge. Perhaps the company has grown into two businesses and it now makes commercial sense to split them up, for example; splitting out an estate agency from a home surveys business (the latter of which is much higher risk). In one recent case we used a section 110 scheme of arrangement to split up a very large farming business into four companies for four siblings. In the process of doing this they paid no income tax, no capital gains tax, no stamp duty on property or shares and no corporation tax. It can be used if a company is owned by two or more shareholders and they want to take the business in different directions – we can split the company into two or more without any tax charge. Section 110 schemes of arrangement are a very useful mechanism to save tax. For an initial free consultation regarding Members Voluntary Liquidation or to find out more about our related services, please contact us. We have offices throughout the South West region including: Exeter, Barnstaple, Bristol, Glastonbury, Hereford, Poole and Swansea and offer free initial consultations with our insolvency specialists and liquidators. If you are unable to get to our offices, we can come to you. Contact us to find out more.